Hi, everyone! 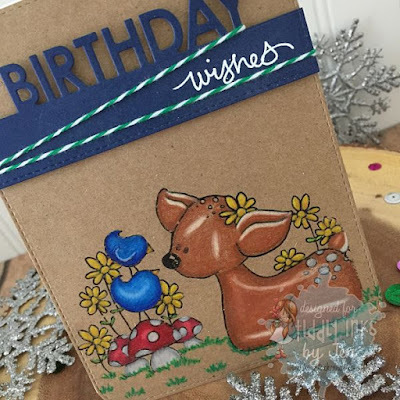 Today is Fabby Friday over on the Tiddly Inks Challenge Blog and my card features the Hello My Deer image. I colored the image with Prismacolor colored pencils on cheap kraft cardstock. I die cut the kraft with my stitched rounded corner die and then added the popped up birthday word die cut from navy blue cardstock. 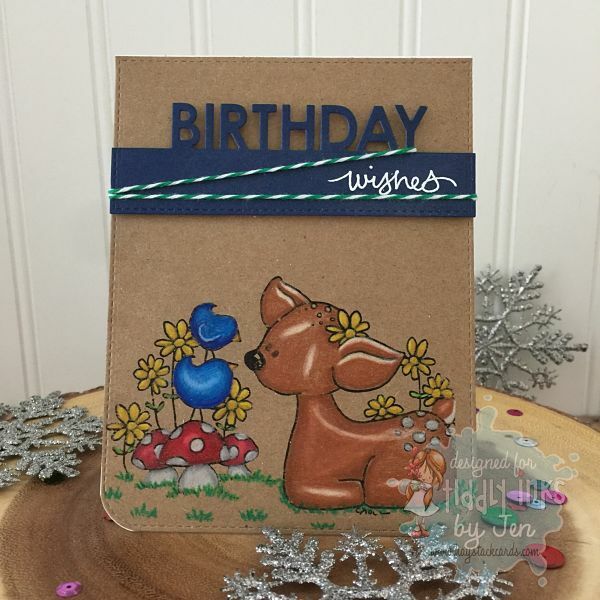 The "wishes" sentiment is stamped in Versamark ink and white heat embossed. I also wrapped green twine around the sentiment panel for additional interest. Hopefully, this makes the perfect birthday card for a nature lover. Now pop on over to the Tiddly Inks Challenge Blog to be further inspired by my teammates on the design team. Have a great weekend and thanks for stopping by! Awesome colouring! I love how you did the sentiment too! The stamps are gorgeous, especially with your lovely coloring, against the kraft cardstock. Beautiful design. 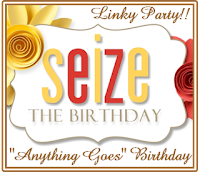 Thanks so much for joining the fun at 2 Crafty Critter Crazies. I hope you were able to pick up the mid-month freebies. Gorgeous card! The scene you've created is adorable and so beautifully coloured. Such a sweet image and your coloring on the kraft is fabulous. A great card and great design.